It’s a “feature” of 7MTT (every version), that when your 7MTT server reboots, or when you restart the “NetApp 7-Mode Transition Tool” service, you lose all the cached credentials and have to re-input them. This is a bit of a pain if you’ve got lots of hosts in 7MTT. It’s doubly a pain since 7MTT (from 2.0 I think) schedules the 7 to C SnapMirror transfers, so all the transition SnapMirrors grind to a halt until you re-input those credentials. 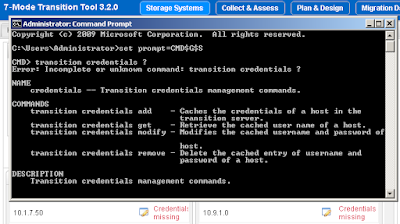 Here’s an example batch file to show how it’s done (adding 2 host credentials). Save as say Add_7MTT_Credentials.bat and double-click to run. Note: Version of 7MTT was 3.2.0. Tip 1: As in the above screenshot, to make your DOS command prompt look nicer, check out this Scott Hanselman post.